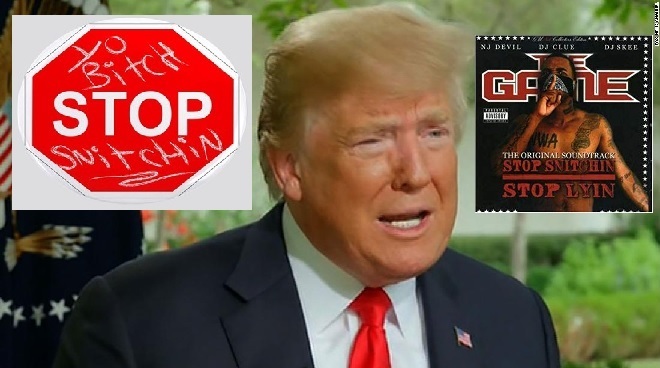 What do #MAGA people think about Trump’s call to “Stop Snitchin’”? The President said something recently that was a little wild. Wait, hear me out. I know the President says lots of things, many of which are somewhere between weird and insane, but a recent statement of his deserves closer scrutiny. Not because it means anything – it doesn’t – but because it is so perfectly emblematic of how inscrutable “supporting Trump” is as a philosophical and/or ideological idea. Before we get to the statement in question, I should clarify which sort of Trump supporter I’m wondering about. It’s clear by this point that are many millions of people who see Trump as a living middle finger to everything they don’t like about their lives or America today – living paycheck to paycheck, black people, Spanish in public places, boys playing with dolls, women, when the “local plant closed down,” etc. These people are uninteresting. They are the yokels Trump was talking about when he said he could shoot someone on Fifth Avenue and stay popular, and they are the ones who will no doubt stick with him even if an N-word tape comes out. Sean Hannity is probably the most famous of these simpletons. I’m more intrigued by the Trump supporters who have abiding political views, who have an ideology, who understand law and reason. Some examples would be Paul Ryan, Lindsay Graham (a lawyer! ), Mark Levin (another lawyer! ), the Powerline guys (ug, lawyers! ), folks like that. In the legal business we would call them “sophisticated” clients. How do they process Trump’s weird comments, particularly when those comments go against everything we know about their own ideological leanings? Trump is here decrying the common prosecutorial tactic of having lower-rung criminals provide information on higher-ups in exchange for a reduction in their own sentence. “Ratting” is what the mafia calls it, or “snitching” in African-American vernacular. Trump is saying it should, maybe, be illegal. Let’s provide Trump with a service that few do and take him at his word. He is willing to entertain the idea that, at least on a federal level, it might be wise for prosecutors to be barred from offering reduced sentences to criminal defendants in exchange for cooperation. I think that’s a fair assessment of what he’s saying, don’t you? That “flipping” is unfair and “almost oughta be illegal.” That’s a pretty fair summary, right? A justice system without flipping would be a very different justice system indeed. Most obviously, it would make it more difficult to convict, or even arrest, the top levels of criminal organizations. Because these are the criminals least likely to get their hands dirty, preferring instead to farm out the commission of crimes to underlings, testimony against them is very valuable evidence. Mafioso are the most famous “rats” but this tactic is used against urban gangs, drug-smuggling rings, MS-13, corporations, white collar criminals, even members of the clergy in the Catholic Church. When a crack addict is busted for possession and tells the cops where he bought his stash, that’s a flip, that’s what Trump is saying should maybe be banned. As I see it, there are a few options involved in reacting to this idea of Trump’s. I genuinely want to know which of these is a most accurate representation of the thought process of more sophisticated Trump supporters. Maybe we can figure this out together. Option number one would be to agree with the statement. Yes, flipping is bad, rats are bad, let’s ban that. It’s a pretty radical idea, but that doesn’t make it wrong. And there are legitimate criticisms to be made of the flipping system, for example that it exerts undue pressure on low-level, low-IQ defendants who feel forced to take a plea rather than go to trial. That’s obviously not Michael Cohen’s situation, but it does describe the predicament faced by a street crack slinger who can’t afford a good lawyer and is facing 24 sleepless hours against a group of hardnosed NYPD officers. So, okay, maybe we should ban that. Is that what Paul Ryan thinks? Option number two would be to say, well, the President doesn’t mean that. This is very problematic to me, because he said it. Pretty clearly and without qualification, in fact! And then he repeated it! So, even if he doesn’t mean it, why would he say it? Wouldn’t it be somewhat concerning if the President was just spouting off controversial legal theories without believing them? How can we tell the difference between the things the President means and the things he doesn’t? Does he only not mean the things we disagree with, but he means the things we agree with? If we start going down this road, it’s maybe even more problematic than just agreeing with him! That brings us to option number three, the nihilistic option, that whatever Trump says and whether he believes it or not is all irrelevant because at the end of the day, he is doing the things we like. Actions speak louder than words, sort of. It’s fine to believe this, but it mandates belief in a lesser proposition: that it doesn’t matter what the President says, it matters what the President does. Not just Trump, but any President. Are people comfortable with this position? Say, for example, Trump said that he had paid for a few abortions in his time and he doesn’t regret it because he didn’t want another kid. But he continued to appoint pro-life judges to the courts. Would that be “okay”? Trump’s words, the words of the most powerful man in the world, have at least some kind of influence on culture and the national psyche. Ronald Reagan was renowned for his ability to communicate with “the people,” to steer the national dialogue with his eloquence. Why don’t we ascribe the same power to Trump, who holds the same office Reagan did and thus wields the same loudspeaker? How should a detective respond to a suspect who refuses to provide incriminating evidence on a higher-up by citing the President’s hatred of rats? The “flippers” quote is interesting in part because it is so radical – it could only be uttered by someone who has truly anarchic views of the justice system, or someone who has no idea what he is talking about. There’s really no middle ground. And that’s also why I’m fascinated by how intelligent #MAGA folks feel about it. Unfortunately, like so much else Trump says and does, this one has gone entirely unaddressed by the larger conservative media movement. So I guess it’s just another proclamation from the President of the United States that nobody thinks about for more than two seconds and fades into the memory hole to be replaced by him saying something else weird and concerning.